The CoolBot maintains the cold chain for postharvest handling of perishable commodities. It is a device that attaches to inexpensive, standard, mass-produced, window or “split-type” air conditioners, enabling it to cool a room down to 1 degree Celsius. CoolBot uses multiple sensors and a programmed micro-controller to convert a standard window air conditioner unit to a walk-in refrigerator cooler unit. It directs the air conditioner's compressor to operate at any desired temperature without freezing up. 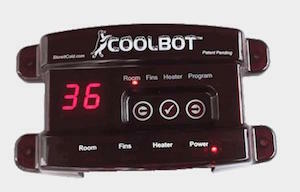 The interface linking the CoolBot controller to the air conditioner allows for 2-minute installations without any training, cutting, soldering or even taping.